My lady, Fiammetta Bianchini, was plucking her eyebrows and biting color into her lips when the unthinkable happened and the Holy Roman Emperor’s army blew a hole in the wall of God’s eternal city, letting in a flood of half-starved, half-crazed troops bent on pillage and punishment.Thus begins In the Company of the Courtesan, Sarah Dunant’s epic novel of life in Renaissance Italy. Escaping the sack of Rome in 1527, with their stomachs churning on the jewels they have swallowed, the courtesan Fiammetta and her dwarf companion, Bucino, head for Venice, the shimmering city born out of water to become a miracle of east-west trade: rich and rancid, pious and profitable, beautiful and squalid. With a mix of courage and cunning they infiltrate Venetian society. Together they make the perfect partnership: the sharp-tongued, sharp-witted dwarf, and his vibrant mistress, trained from birth to charm, entertain, and satisfy men who have the money to support her. Yet as their fortunes rise, this perfect partnership comes under threat, from the searing passion of a lover who wants more than his allotted nights to the attentions of an admiring Turk in search of human novelties for his sultan’s court. 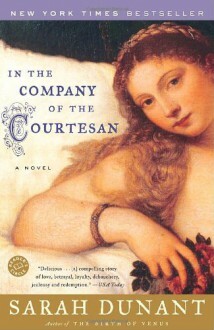 But Fiammetta and Bucino’s greatest challenge comes from a young crippled woman, a blind healer who insinuates herself into their lives and hearts with devastating consequences for them all.A story of desire and deception, sin and religion, loyalty and friendship, In the Company of the Courtesan paints a portrait of one of the world’s greatest cities at its most potent moment in history: It is a picture that remains vivid long after the final page.From the Hardcover edition. I seldom write two-star reviews, but at about the 30-percent mark, this story just wasn't worth my time anymore. It's crass, slow-moving, and just an ugly read. Yuck. http://vysed.booklikes.com vysed 4.0 I think I'm weird. text I think I'm weird. Really wanted to like it, as it was highly recommended by a friend, but I found it dragged. I kept waiting for something to happen, besides the move to Venice, and kept reading and reading and finally gave up.